Space flight on a city street. – Cool San Diego Sights! Space flight on a city street. Street art flourishes on the sidewalks of San Diego. 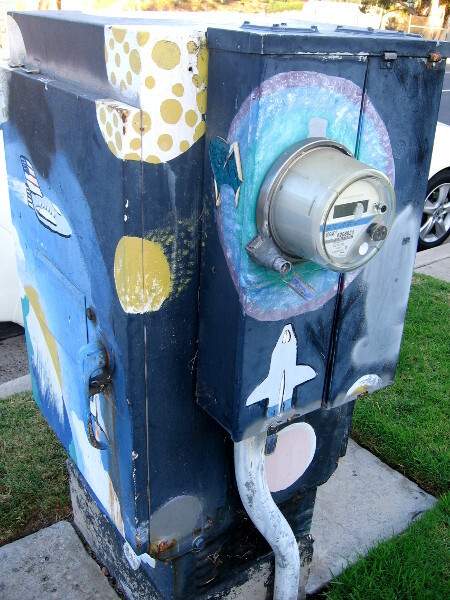 Many electrical transformers and utility boxes have been creatively painted to represent colorful scenes both real and imagined. Most have a primitive or folk art vibe. I’ll snap lots of photos for this blog! Here’s a box downtown at Sixth Avenue and Elm Street that features an airplane and space shuttle zooming above clouds between planet Earth, the Sun and the Moon. At least, that’s what it looks like to me! Colorful space imagery on a third side. Previous Previous post: The bizarre Tractor Room bar in Hillcrest. Next Next post: Animal rights poster features cute pig.